Employee engagement is a top UCI and UC priority. Leaders inspire employees to focus their individual talents on the goals of the organization and to contribute at the highest level. Effective leaders are also guardians of the culture and exemplars in living the organizations’ values. As a result, great leaders are often met with the prize of engaged employees who feel prepared and empowered to progress in their careers. 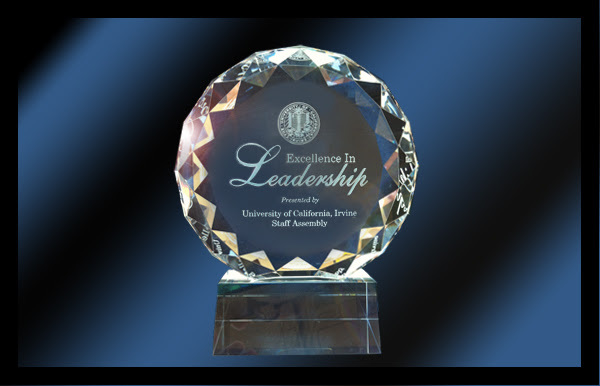 The UCI Staff Assembly Excellence in Leadership Award recognizes these exceptional leaders at all levels. Any direct report may nominate an individual manager or supervisor. However, if more than one person nominates the same individual, they will be asked to work with other nominators to combine their nominations into one document with one contact name. All nominees will receive an email from Staff Assembly and the Provost and Executive Vice Chancellor congratulating them on their nomination and inviting them to attend the Staff Service Awards, where the announcement of these awardees will be made. We are recognizing leaders with four variants of the Excellence in Leadership Award. Plus, an additional overall award for excellence across all three leadership competencies. Nominations will be accepted online or on paper via ZotMail. Fill out and submit the online nomination form on EEE Scout. You may save and return to the form as many times as you like before officially submitting it. Download and print the paper nomination form and follow the instructions on the first page. Please contact the Staff Assembly Vice Chair, Megan Enciso, with any questions, comments, or suggestions.